BLOWOUT SALE. 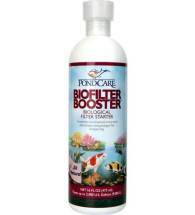 Natural Algaecide for Ponds. 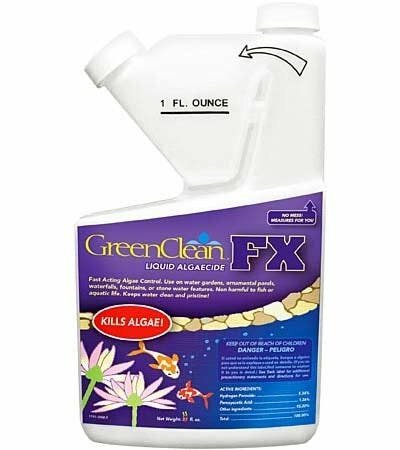 BioSafe Systems GreenClean FX Liquid Algaecide is a highly effective and affordable solution to algae problems that plague a wide variety of backyard water features. Works on contact and suppresses, controls and prevents algae-causing conditions in ponds. Will NOT affect pH and is safe to people, pets and fish. • Sinks to bottom — perfect for deeper waters! Low: Apply 3 tsp per 50 gallons or 5 oz per 500 gallons of water. 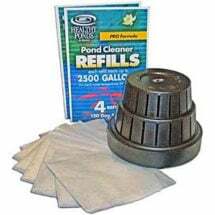 Medium: Apply 5 tsp per 50 gallons or 8.3 oz per 500 gallons of water. High: Apply 7 tsp per 50 gallons or 11.6 oz per 500 gallons of water. Repeat dose every 3 days until algae is under control. Once algae is controlled, apply once a week. Apply to area with greatest water flow to ensure rapid movement and adequate mixing. Use to reduce the toxic buildup created by fish waste, uneaten food and dead algae. Combines beneficial bacteria and enzymes to rid water of excess nutrients. Barley Straw improves water quality by reducing algae, other particles and odors. 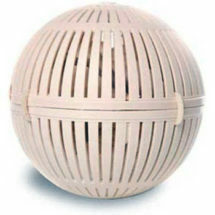 Contains beneficial bacteria and enzymes to keep water clean for up to 8 months.